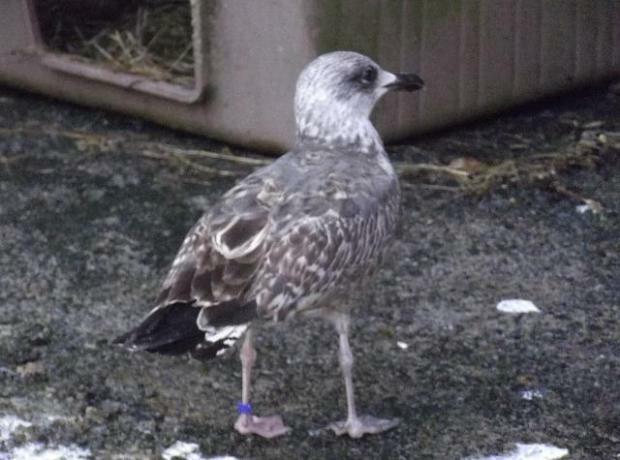 What is Orchard the Lesser Black Backed Gull doing in Guernsey? Normally found much further North it is unusual to see a Lesser Black Back Gull in Guernsey during the Winter. 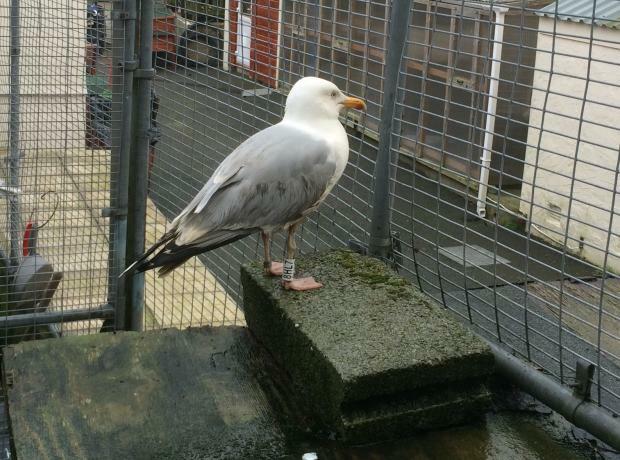 On the 1st February a 1 year old female Lesser Black Back Gull was rescued near Route des Capelles unable to fly. 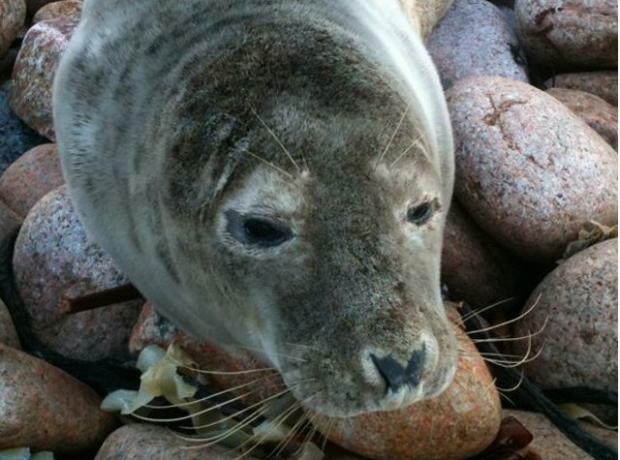 Once at the GSPCA she was cared for initially inside and then put in one of the rehabilitation flights. The young bird was named 'Orchard' and a close eye kept on her during the first 24 hours to monitor the condition of her wings. Just under two weeks ago an injured Herring Gull arrived early one evening having been found with a white material wrapped around the birds legs. The bird had been rescued from Mont Cuet and was very weak on entry and extremely hungry. As the finder didn't know what to call the bird we placed a picture on our facebook and after many great names the next morning having made it through his first night we decided on the name 'Steven Seagull'. Today Shelter staff and volunteers had the pleasure of a local expert in Gulls give a talk on their movements, the tracking of them and their behaviour. Paul Veron who has been ringing birds since 1976 and has rung over 53,000 himself since starting has a wealth of knowledge that he shared with the GSPCA team before they started their work. Paul talked primarily about the movements and ringing work of the Herring Gull, Black Back Gull and Lesser Back Gull all of which breed around the Bailiwick. Only a day after her release the lesser black back gull Shelter staff named Lady Ga Ga was seen at Chouet and looking well. The staff would like to thank Paul Veron for the picture and the update (Lady Ga Ga is the bird on the right). On the 20th April the Shelter had a call to collect a Gull near the Chouet Lanfill site. ACO Geoff George attended to find the bird covered in some sort of pink building filler. The poor bird had it all over its body and feathers. She was in a field near the site with her wing stuck to her body and unable to fly. Geoff managed to catch her and she was brought to the Shelter for some immediate first aid. We are pleased to report that the first of the 8 gulls we saved have been released back into the wild where they belong. GSPCA staff were joined by a large group of the press to celebrate their release after 4 weeks of care of the 12 surviving birds. They were released on the west coast and all quickly took to the air and flew into the horizon as a flock. Since the weekend we have now recieved a total of 29 gulls all showing extreme cases of illness and in the worse case even death. We are still monitoring the situation but are unaware of the reason for this problem as are still awaiting test results. Another 4 dead gulls have been found in the last 24 hours. We are still closely monitoring the situation and awaiting the test results. If anyone does find any more birds alive or not we would please urge you to get in touch. Not knowing what has caused this could be putting you or your pets at risk. If you do handle or come into contact with any of these birds please ensure that you wash your hands thoroughly.